I like to sleep, for one thing, and, as is the case with some other aspects of my life as time goes on, I don’t do it as well as I used to. I dislike getting up in the dark. Part of my objection is to the abrupt blaze of harsh electric lighting: getting smacked in the retinas is not my idea of the best way to ease into a new day. In any event, when other people rhapsodize about the tranquility of the morning and the beauty of sunrise, my pat response is that I appreciate those things all the more because of the relative rarity with which they appear in my life. To avoid getting up in the dark this time of year, however, would require indulging in torpor with a rigor that I haven’t been able to muster since I was a teenager. I might not like it, but workaday prudence dictates that I get up in darkness. And there are, admittedly, days when the sunrise rewards me for adhering to an adult schedule. A few mornings back, we had one of those days. A scrim of cloud threw a net across the sky, woven just tight enough to capture the sun’s first rays. 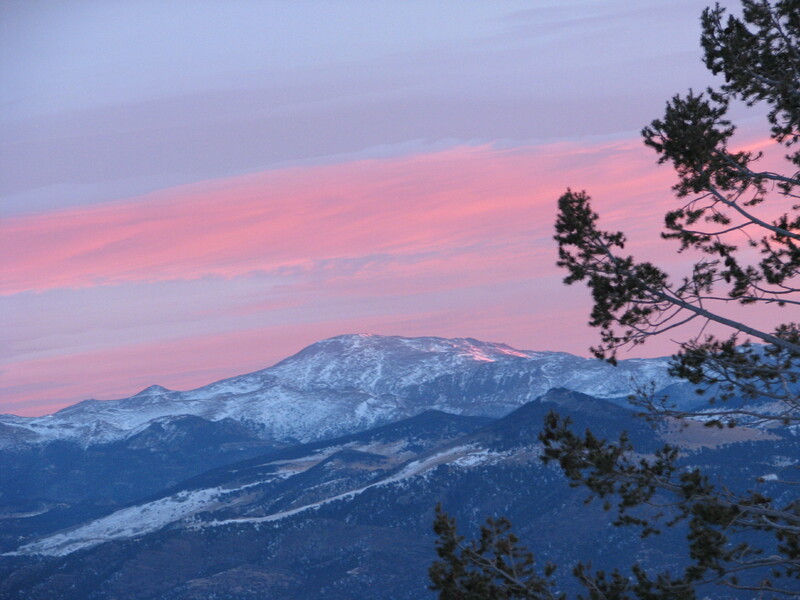 The seam where sky meets earth was wrapped full-around with a luster of rose and lavender, anchored by a heavier bank of clouds south of Pikes Peak that glowed like embers from a vast celestial campfire. Snow lingering on the mountain from the arctic front a couple of weeks ago reflected a distinctly un-snowy hue. 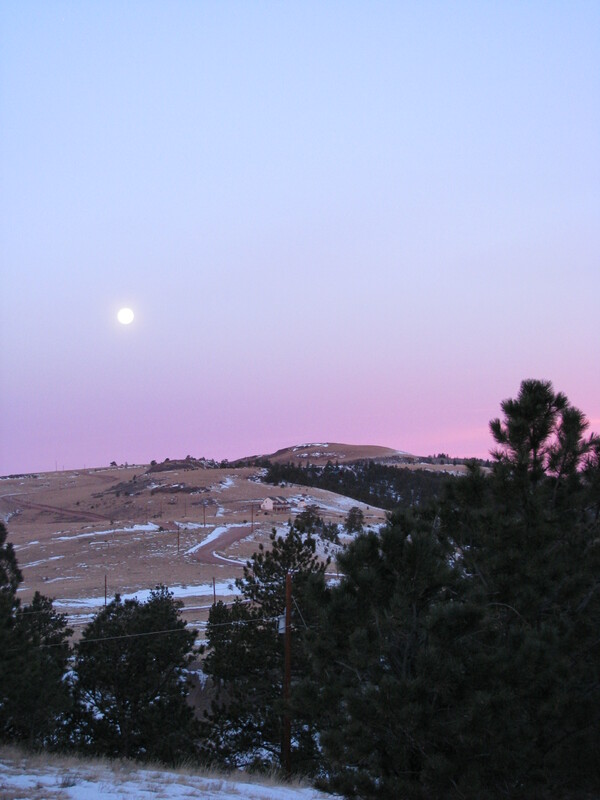 In the west, a moon one day past full was suspended like a pearl against a backdrop of shell-pink. We don’t always get wraparound displays like this, but I welcome them, especially this time of year. In its winter dormancy, the landscape is rendered in sepia tones, or black and white. The world seems pensive, preoccupied. 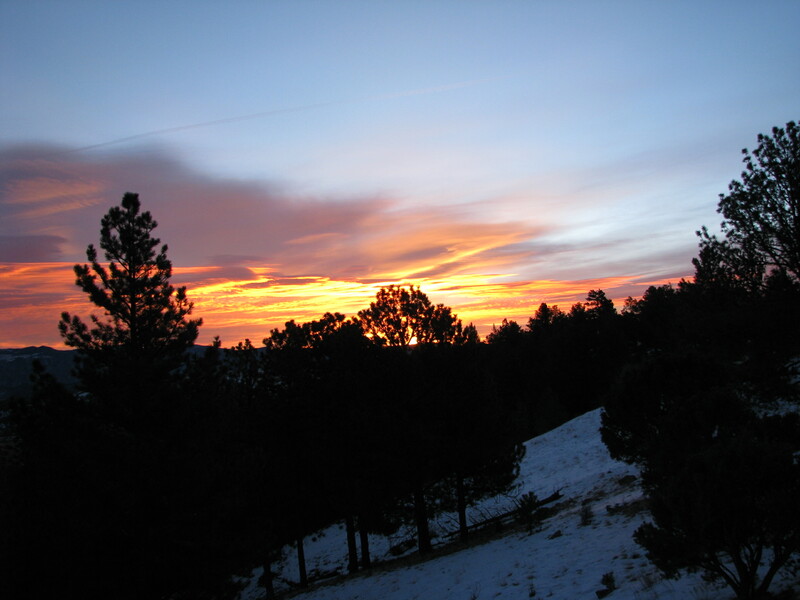 Then: a showy sunrise, a vivid sunset. I appreciate the colors fanned across the sky like swatches presented by an over-enthusiastic painter. In a season when wind and cold air counsel the biding of time, a harboring of resources, these fleeting extravagances of color urge alertness, at least a couple of times a day. There’s much to be said for hunkering down, and where I live this is the season for it. The skies that bookend these clipped winter days, though, remind me not to withdraw so comfortably into the warm cocoon of indoor reflection I miss the show.